Although most of the planet has been discovered and well-documented, there’s still plenty of places that remain relatively unknown, and for no good reason. Here are 10 Incredibly Gorgeous Places You’ve Probably Never Heard Of. Located two hours off the coast of Sydney, Lord Howe Island is not only remote geographically, but no more than 400 people are allowed to visit it at any given time. Accordingly, it looks like a literal paradise—from flawless beaches, a lagoon so blue it seems like a joke, a coral reef, volcanic peaks, rainforests, and wildlife that’s native only to the island. 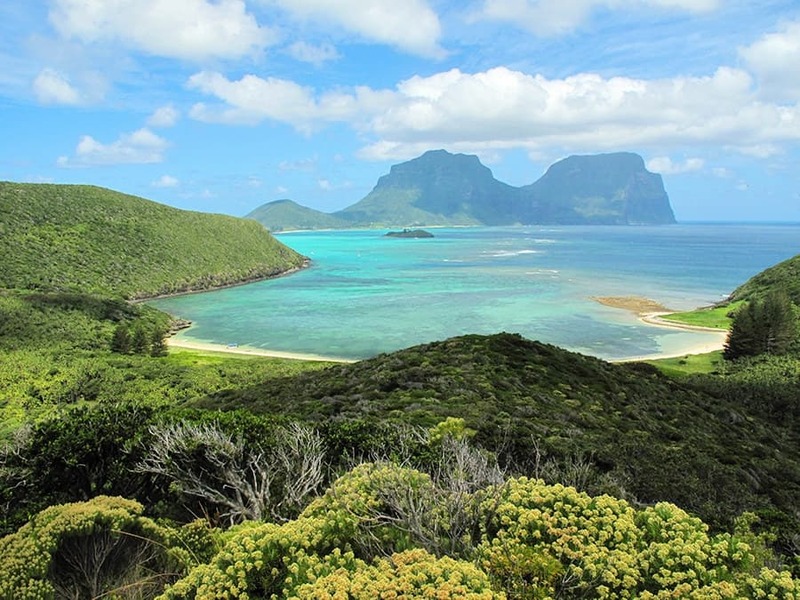 If dinosaurs were ever holding out in secret, they’d probably pick Lord Howe Island. Any time someone mentions a canyon to check out in the United States, you’d probably drone out and assume they just mean the Grand Canyon. However, most people would consider Antelope Canyon (also in Arizona) to be somewhat more interesting. The canyon was created over thousands of years of rivers and streams eroding the sandstone, and the experience of walking through miles of them would be pretty mind-blowing. “Glen Coe” is located in the Scottish Highlands, and is not only considered among one of the most gorgeous places in Scotland, but Europe as a whole. The “Glen of Weeping” contains Bidean nam Bian, one of the highest peaks in Scotland, as well as the winding River Coe. The glen got its namesake from its foggy, grim grandeur, but thankfully you’ll probably only weep from the great views. Or running from the Loch Ness monster. Whichever. Translated into English, “pamukkale” means “cotton castle” in Turkish, which seems legit, considering that it looks like a giant pile of cotton balls. Once, the ancient Greco-Roman city of Hierapolis was built atop the stunning hot springs and otherworldly travertines (the layered terraces in the photo above), creating a unique mix of natural and architectural history. And that’s without mentioning that it’s pretty cool to chill out in the very same pools that the Greeks and Romans did, thousands of years ago. Located across the borders of Namibia and (predominantly) South Africa, Namaqualand encompasses about 170,000 square miles—a few thousand miles larger than the state of California. Throughout the majority of the year Namaqualand looks like most of the region—arid and dry—but in spring it effloresces into something completely mesmerizing. Hundreds of thousands of daisies bloom, transforming the dry, empty land into on of the most gorgeous places on earth. Is this photo from a beautiful, untouched island in the South Pacific? Nope. Plitvice is the oldest national park in Southeast Europe, the largest in Croatia, and most noticeably, it doesn’t look like anything out of Europe, much less Croatia. Now that Plitvice is a World Heritage Site, it will remain in a state much like it was when it was first opened in 1949—aside from the occasional walkway. Not only were all these amazing terraces built by hand, but they are more than 2000 years old and cover over 4000 square miles (about the size of Los Angeles’s sprawl). The terraces are so old now that they look wholly natural; indigenous Filipino peoples traveled into the Ifugao mountains two millennia ago, seeking a permanent solution to providing enough food for their people. Still, they probably weren’t expecting that their rice terraces would be quite this permanent. Though Norway contains the largest number of fjords in the world, Sognefjord is the largest (and second-largest in the world), and probably one of the most gorgeous places as well. With depths that go down nearly a mile and peaks that go over one into the air, you could spend many years just trying to see everything this 127-mile (205km) long waterway has to offer. And you’d need plenty of help, but thankfully there’s dozens and dozens of boats that troll these crystal-clear waters daily. Located in Hunan Province, China, Wulingyuan is known for its approximately 3100 naturally created, towering sandstone pillars. After the release of Avatar, it’s pretty hard to think of this place as more than coincidentally a pretty close real-life version of Pandora. You’d have to imagine that walking on the ground floor would be at least as intimidating as running into a Na’vi in the wild. Though Iceland is known for many of its waterfalls, none is perhaps as beautiful as Gullfoss, located on the White River (“Hvítá”). Translated from Icelandic, its name means “Golden Falls.” What makes the falls particularly stunning is that they traverse over three massive “steps,” plunging onto two stages, and then down a 32 meter (105ft) deep crevice. This creates the allusion that the falls are perching above an abyss—albeit probably much better looking than you’d imagine an abyss. Do you know of any other under the radar gorgeous places? Let us know in the comments.